Virginia shield with MUTCD fonts. 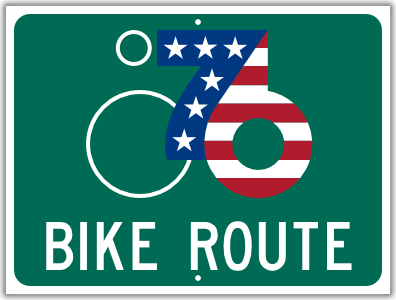 This marker was placed along the transcontinental Bikecentennial route that was devised in 1976. Here is the original 1976 design, complete with American flag colors. The sign is 24 by 18 inches. It is printed using cutting-edge technology, to replicate accurately the look of classic Silver Scotchlite sheeting.